Join us for our 8th incredible trip up and down the proposed route for the Firefly Rail Trail on Saturday, March 23, 2019. This year we are featuring 3 starting locations with registration beginning at 8 am and the ride starting at 9 am. The full out-and-back course from Athens or Union Point is 87 miles, with on-route support and fully-stocked SAG stops (including restrooms) every 9-13 miles in Athens, Winterville, Crawford, Maxeys, Woodville and Union Point. 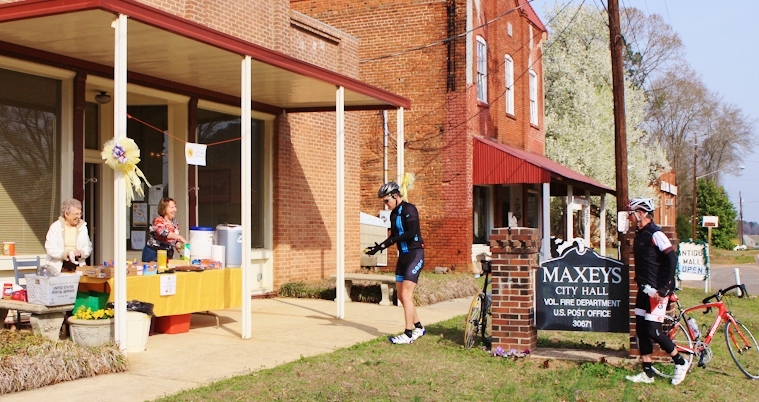 This on-road ride features the lowest-traffic roads we could find close to the historic corridor of the Georgia Railroad Athens Branch. Riders who enjoy flatter terrain will especially enjoy the route from Union Point to Maxeys. Options as short as 20 miles are available, making this a perfect ride for cyclists of all interests and abilities, and a great warm-up for BRAG. Pre-registration/rider bag pick-up will be Friday, March 22 from 3 - 6 pm at GA Cycle Sport Concepts, 1029 Baxter St., Athens. All participants will receive a special edition Firefly t-shirt, one free serving of Terrapin beer at the Jittery Joe's finish in Athens (age 21 and over with ID), a great swag bag from our sponsors, a day of fun, and a big THANK YOU for supporting Firefly Trail! In Athens beginninng at noon, enjoy live music from a band to be determined, Terrapin Beer and food for purchase from UGA's official food truck 1785 Taqueria at the Jittery Joe's finish line. The Union Point finish line will also feature food and beer from vendors to be determined. Live music will be preformed by to be determined artists. Everyone who registers before March 22 and decides not to ride will still receive a Firefly t-shirt (while supplies last) and a rider goodie bag. From Monday, March 25 until Friday, April 5, bags will be available at GA Cycle Sport Concepts, 1029 Baxter St., Athens. When completed, the Firefly Trail will provide safe opportunities for walking, running, bicycling, skating, active commuting, and other non-motorized activities. It will be a nationally significant trail connecting schools, businesses and communities across three counties. In 2017, Athens-Clarke County opened the first section of the trail and ACC voters approved a special local option sales tax that will provide $16.7 million in funding to complete the trail from Athens through Winterville. Meanwhile, Maxeys and Union Point have received $100,000 grants to build segments within their cities, and other communities are exploring opportunities and building support. Your funds and your participation help promote and support the development and completion of the Firefly Rail Trail. Pre-ride packet pickup and registration will be available on Friday, March 22, 3 - 6 p.m., GA Cycle Sport, 1029 Baxter Street, Athens. Georgia Cycle Sport will also be providing pre-ride mechanicals and sag support on the day of the ride. On March 23, packet pick-up and day-of registration open at 8 a.m. at Jittery Joe's Roaster in Athens, Winterville Depot in Winterville and Union Theatre in Union Point. In Athens plenty of free parking is available at the Roaster, The Athens Cotton Press, and the Athens-Clarke Co Bobby Snipes Water Resource Center. Lotta Mae's Supply Co. , across the tracks from the Roaster, will be open for business. DO NOT park in their designated parking spaces. In Winterville, please park behind the depot, along Magnolia Lane/Georgia Avenue, or at the Community Center off Church Street; Do not at Pittard Park which will be hosting a private event. In Union Point ample parking is available downtown. The ride starts at 9 am from all locations. The course will close and on-road support will end at 4:30 p.m. SAG stops will close after returning riders on this out-and-back course pass through. Ride with GPS Routes: Below are the routes from 2018. Our team is looking at possible changes for 2019 and will update this information soon. Cue sheets will be posted to our website soon. More activities from Firefly Trail, Inc.